MULTI-TITLED Franz Pumaren is set to join GlobalPort as a coaching consultant after getting the green light from Adamson, which he is set to lead in the coming UAAP basketball season. Unlike the usual practice where PBA coaches act as consultants for college teams, this is one of the rare times when a coach from the UAAP is tapped as a consultant of a professional ballclub. “It’s one for the books,” says Akari sports director Russelle Balbacal, whose company backs the Adamson sports program. “We are not going to clip the wings of Coach Franz. "Advantage din ito para sa Adamson, our players will even more look up to him, kasi PBA hawak niya at the same time. Nangako naman si Coach Franz na priority pa rin nya ang school,” he added. Pumaren won five championships with alma mater La Salle in the UAAP and also shone in his short stint as coach of Air21 in the PBA, leading the Express to the semifinals of the 2014 Commissioner's Cup. He has also had a good start to his Adamson reign, leading the Falcons to the finals of the Fr. Martin Cup and to the quarterfinals of the Filoil Flying V Cup preseason tournament. At GlobalPort, Pumaren is expected to be a steadying presence to a coaching staff that is on transition period after longtime coach Pido Jarencio was moved up to head of basketball operations. Batang Pier officials said they are choosing between assistant coach Eric Gonzales and assistant team manager Johnedel Cardel on who to take the coaching reins in the season-ending Governors Cup. Pumaren’s former player and now La Salle women’s team coach Cholo Villanueva said he expects the veteran coach to make a difference for the Batang Pier. “May sistema kasi talaga si Coach Franz, kailangang bigyan siya ng break at leeway na idevelop yung team niya. Tignan mo yung Air21, dati walang player yun Shopinas yun, pero tignan mo nag-overachieve,” said Villanueva. “Tingin ko nga, kung nagtuloy-tuloy yung Air21 baka nag finals na 'yun o nag-champion pa yun. Kung next season pa siguro nun after 2014 baka nag champion pa 'yun,” he added. 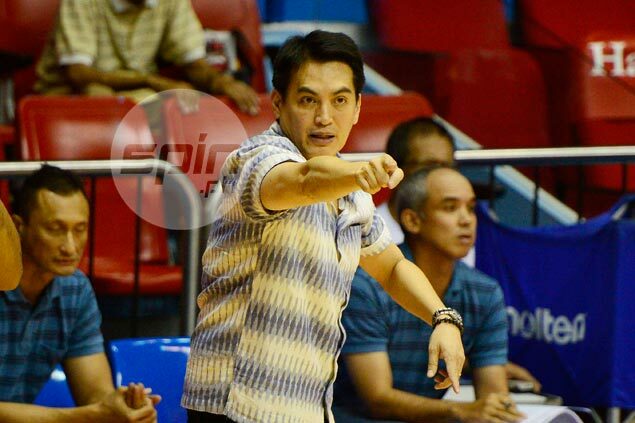 As early as 2014, Pumaren was already mentioned as a possible coach for GlobalPort. “Siguro ito yung right time na kunin siya, everything happens for a reason. Baka yung last time na kinausap siya for the head coaching job tapos hindi natuloy, baka blessing in disguise yun, we never know,” said Villanueva.